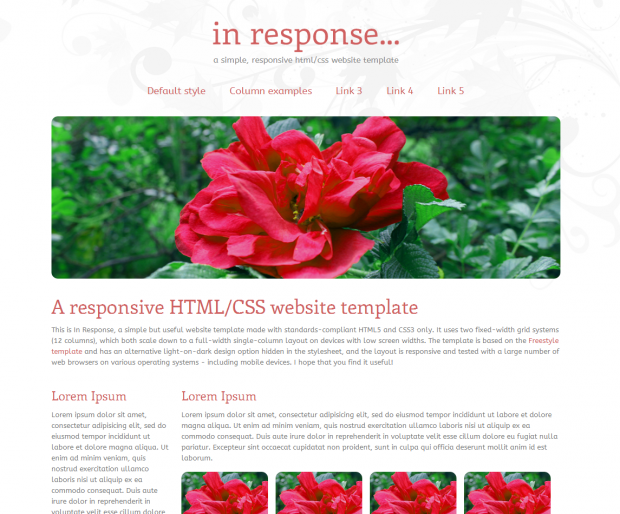 In Response is a simple, optimized and free HTML5/CSS3 website template with a responsive layout. It is based on the dual-grid system from the Freestyle template but with several useful additions. In Response offers fixed-width 12-column grids, which both scale down to a full-width single column layout on mobile devices. Multi-column layout samples are included, as well as a simple thumbnail class that can be used for photo galleries. Also included, although not shown in the template, is a light-on-dark design option that can be applied by removing the “light” body class. Check it out, and post any feedback you may have in the comments. A follow-up post on customization of the template will follow during the weekend. Downloaded the new “In Response” template – just the job thank you. It opens fine in Firefox, Chrome, Safari, Opera … but with IE10 the style sheet doesn’t get applied. Any ideas ? Very Nice template and works in all top 5 browers. I used one of your other templates on my very first site and was impressed.